SCOTTSDALE, Ariz. (AP) Trevor Story saw the Colorado Rockies' lineup and thought ahead to the regular season. 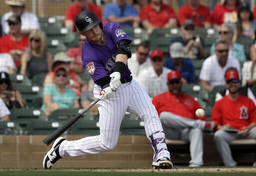 "It gives you a little excitement, maybe a little preview," the All-Star shortstop said after hitting a home run and getting a base hit in three at-bats Wednesday against the Arizona Diamondbacks. "I think we're getting there, we feel like we're heading in the right direction," he said. Story is coming off the best of his three big-league seasons after hitting 37 homers and stealing 27 bases in 2018. He made his first All-Star appearance and homered in that game as well. He was also instrumental in helping the Rockies to the wild card and a berth in the National League Division Series, their first since 2009. For now, manager Bud Black has moved Nolan Arenado to the No. 2 spot in the batting order, behind Charlie Blackmon. Free-agent addition Daniel Murphy slots in between Arenado and Story, with outfielders David Dahl and Ian Desmond behind the shortstop. With Kyle Freeland also on the mound and taking his turn at the plate Wednesday, it could be the lineup that takes the field in the opener March 28 at Miami. New second baseman Ryan McMahon and veteran catcher Chris Iannetta also started. If Story - fully healthy after right elbow pain threatened to sideline him late last season - can duplicate his 2018 success, the Rockies may be even more dangerous than last season's 91-72 squad. "Trevor's doing well. He's locked in," manager Bud Black said. "He's in a good spot." For the first time, Story is coming into a season with health and confidence. His strong 2016 rookie year ended early with a right thumb injury. "That experience helps me a lot," Story said of last season. "At this point it's about how I'm attacking pitchers, and realizing how they're attacking me, and creating a good plan." Story struggled at the plate in 2017, striking out an NL-high 191 times and batting just .239. "I want to strike out less," said Story, who still struck out 162 times a year ago. "There's always places to get better in this game," he said. "Make more adjustments and I want to keep getting better on defense." The Diamondbacks' Nick Ahmed won the Gold Glove for NL shortstops last year. But with Arenado and his six awards to Story's immediate right, he doesn't have to look far to see the possibilities. "It's inspiring for sure. I see the work those guys have put in and it's something I want to win," Story said.